Upon rearranging my game shelf I stumbled upon this books tucked in a far back corner away from the light. It is another role playing game that I had picked up and never played. 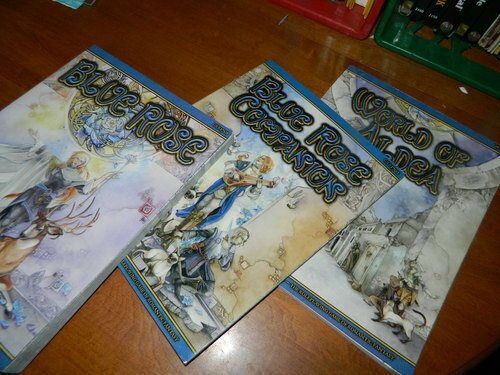 Blue Rose The Roleplaying Game of Romantic Fantasy is one of those games that I picked up on a whim. I figured it would be a pretty easy game to run since it was a watered down version of the d20 system. And, since I had several ladies around the game table as well it might have been a fun system to run. My problem was trying to get it going in the first place since we’ve been in a fantasy campaign for a while and ending one system to jump into another fantasy system wasn’t my style at the time. I’d like to shake things up a bit and run another genre for a bit and then jump back into a fantasy setting. I figured Blue Rose would do the trick, but the funny thing was by the time I got to thinking about running Blue Rose, my game table had dwindled in size leaving two fellows and I don’t think they were in the mood for a romantic fantasy setting. Maybe, one of these days I’ll dust this game off and give it a proper go. It might be fun to do. After all I read a ton of Marion Zimmer Bradley and Mercedes Lackey in my day and I think I can do the game justice. This entry was posted in role playing game and tagged blue rose, blue rose roleplaying game, d20, role playing, true 20. Bookmark the permalink.